First of all, I would like to thank Edelweiss and HarperTeen for providing me with an ARC in exchange for an honest review. 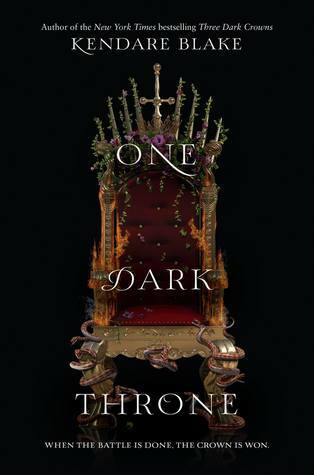 One Dark Throne is the second installment of the Three Dark Crowns fantasy series by Kendare Blake and is due to be published this fall. It is a solid follow-up novel to the best-selling Three Dark Crowns and equally intriguing. As everyone surely remembers, the ending of the first book consisted of two major and well executed plot twists that, in my opinion, were very surprising, considering that about 80% of the story was characterized by a relatively slow pace and lack of action, and left the things up in the air. In contrast to its predecessor, One Dark Throne showed a welcome increase in both the pace and the amount of action comprising the book and was an overall lighter and quicker read. As regards the character development, Kendare Blake continued to do an impressive job in One Dark Throne, as well. I believe that Mirabella, Katharine and Arsinoe are three of the best-drawn fantasy characters I have ever encountered. In addition, the author created a great number of secondary and rather memorable characters whose names I still mix up now and then. Virtually each character of this series plays an important role in the plot development and I think that the superb characterization, along with the fascinating world-building, allows Three Dark Crowns and One Dark Throne to stand out in the realm of fantasy books. As was the case with Three Dark Crowns, One Dark Throne is written in the third-person, in the present tense. Reading a fantasy novel told in the present tense can be an awkward experience at the beginning, but fortunately I quickly got caught up in the beautifully written narrative. The events of the second installment are set in the island of Fennbirn, during the Ascension Year. The three sisters are supposed to kill each other in order to ascend to the throne, which explains the choice of title. It was interesting to observe the personality changes of Katharine who was portrayed as a villain and found herself in the middle of a love triangle in this second installment. Mirabella also displayed some cruelty at the beginning but she returned to her normal self soon. I wonder whether I am the only one who has noticed that Arsinoe appears to be a little more priviliged than the other two queens, in the sense that the chapters focusing on her character are slightly longer and greater in number. I thoroughly enjoy the relationship between Arsinoe and the mainlander Billy and the manner in which it has evolved from their first encounter. I think that Arsinoe is my favourite sister, if I were to pick one. In One Dark Throne there were also some interesting things going on with Jules, Arsinoe’s devoted childhood friend. One Dark Throne doesn’t include any revelation as shocking and unforeseen as those experienced while reading Three Dark Crowns, but there is a number of deaths which will certainly surprise you and an ending that is bound to leave you burning with curiosity about what is going to happen in the next installment of the series. All in all, One Dark Throne is a complex dark fantasy novel which will undoubtedly prove a satisfying read for those who have enjoyed the first book of the series. I always appreciate a series which improves progressively and features creativity and it seems that Three Dark Crowns is one of those.